Review posted August 3, 2016. Health Communications, Deerfield Beach, Florida, 2016. 229 pages. I think of Steven Stosny as a relationship guru. His book, You Don’t Have to Take It Anymore (retitled Love Without Hurt) dramatically changed my outlook when my marriage was falling apart and helped transform my own anger into compassion. More recently, his book Living and Loving After Betrayal helped my healing process after divorce. I also attended his Compassion Power Boot Camp years ago and enjoy reading his “Anger in the Age of Entitlement” Psychology Today blog. 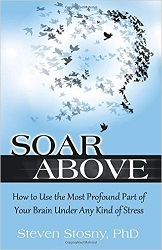 It was from the blog that I learned about his new book, Soar Above. At last a book for everyone and for every situation of life – not just when you’re in a tough relationship. This book I can recommend to everyone without fearing they’ll think I’m saying something negative about their relationships. Why do so many smart and creative people make the same mistakes over and over, in life, work, and love? At what point does the unavoidable emotional pain of life become entirely avoidable suffering? How do we escape suffering while remaining vibrant and passionate about life? Most of this book talks about the tension between the Toddler brain and the Adult brain. They are specific sections of our brain. The Adult brain does develop later in life – but sometimes it’s hard to get out of the habit of reacting with our Toddler brain. The result is self-fulfilling prophecy. Other people are bound to react negatively to the negativity I transmit. Fortunately, the Adult brain has the power to override Toddler brain habits and intentionally develop new ones that serve one’s long-term best interests. Developing new habits is not an easy process, but it’s utterly necessary to soaring above. The Adult brain is good at lots of things, including calming down Toddler brain alarms. But where it really helps us is with its ability to create Value, Meaning, and Purpose. Value is a special kind of importance that goes beyond survival and biological needs. To value is to make people, things, and ideas important enough to appreciate, nurture, and protect. We create meaning and purpose in our lives by honoring the value we bestow on people, objects, concepts, behaviors, and some notion of spirituality. A sunset has value if and only if we give it value – that is, invest energy and effort to fully perceive it, which allows us to appreciate it. While it does nothing for the sunset if we value it, valuing it does wonders for us. The moment of value creation makes us feel more vital, engaged, interested, and appreciative – in short, more alive. Life means more at the instant we create value, just as it means less when we’re not creating value. Most positive emotion, passion, meaning, purpose, and conviction come from creating and protecting value, and much emptiness, aggression, and depression result from failure to create value. I’m posting lots of quotations from this book on my Sonderquotes blog. I’m also going to reread it to help its message sink in. If you ever feel bogged down in your Toddler brain, reacting with blame, denial, and avoidance; if you’d like to feel more Meaning and Purpose in your life, I can’t recommend this book highly enough.